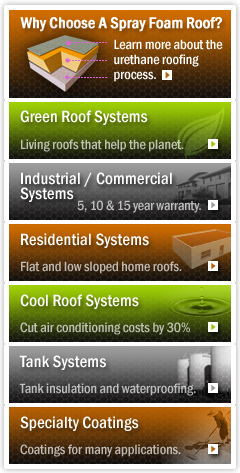 Spray Foam Roofing Systems were designed with the Industrial/Commercial sectors in mind. We provide long-term roofing solutions with minimal maintenance required. Many times we install Spray Foam over corrugated and standing seam metal, built-up asphalt, tar and gravel, wood roof decks, and concrete roof decks. The roof can be flat, low slope, or steep slope. We custom manufacture your new Spray Foam Roofing System according to your needs. We can add slope for drainage, get rid of ponding water, add new or additional skylights, and do what conventional roofing methods are not able to do. With Spray Foam Roofing Systems, you get the only seamless roofing system available as well as the best insulation system on the market at no additional charge. We are proud to say that since 1975 we have worked for some of the best companies in the Western United States. If you want the best, look no further. We look forward to offering you a professional service experience and a long-term working relationship.